Who does not dream of beautiful, curly eyelashes? With the eyelash curlers of Tweezerman you create curly eyelashes for a beautiful look. Curled eyelashes can ensure that your eyes are even more beautiful. With the eyelash curlers of Tweezerman you can leave a lasting and powerful impression! The eyelash curlers of Tweezerman are very popular. This is not surprising, because the curlers are of extremely good quality and convenient to use. The silicone pads in the eyelash curlers will not crease or stick to your eyelashes, so you can create the most beautiful eyelashes. In addition, the pads are also hypoallergenic and the eyelash curlers by Tweezerman are suitable for everyone! The curlers have a sturdy construction that makes them easy to open and close. As if that was not enough, there are also 3 replacement pads included in the eyelash curlers for a long life of the eyelash curler. But how do you use the eyelash curler of Tweezerman exactly? If you are planning to use eyeshadow or eyeliner, it is advisable to do this before you curl the eyelashes. This way you can easily reach your eyelids so you can create the most beautiful eye look. Once you're done with this, you can place the eyelash curler on the top lashes and then gently press the clips for about 10 to 15 seconds. After this you can open the eyelash curler again and your eyelashes will curl beautifully. Then apply a little mascara for the most beautiful effect and voilà, you can enjoy beautiful curled eyelashes the rest of the day! 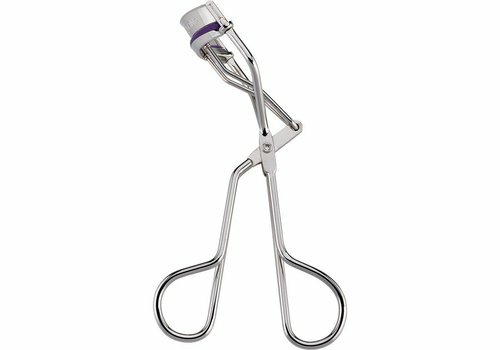 Buying an eyelash curler? Order your Tweezerman eyelash curler today. Do you have very straight lashes of yourself? Or do you just want to give your own lashes that extra curl? Then the eyelash curlers from Tweezerman are the perfect choice for you! With the eyelash curlers of Tweezerman you can make your eyes jump out. The quality of the curlers is absolutely sublime, so you can do years with the eyelash curlers. There are also 3 extra pads included for an even longer life of the eyelash curlers. So do not hesitate any longer and order your Tweezerman eyelash curler at Boozyshop today!